This is the book which everybody doing a research project has been waiting for. Writing in an informal and accessible style, David Silverman offers the reader an entry into the broader issues of qualitative research that many textbooks gloss over - the underlying arguments of qualitative research and the key debates about its future direction. Silverman shows how good research can be methodologically inventive, empirically rigorous, theoretically-alive and practically relevant. Using fascinating materials, ranging from photographs to novels and newspaper stories, this book demonstrates that getting to grips with these issues means asking ourselves fundamental questions about how we are influenced by contemporary culture. 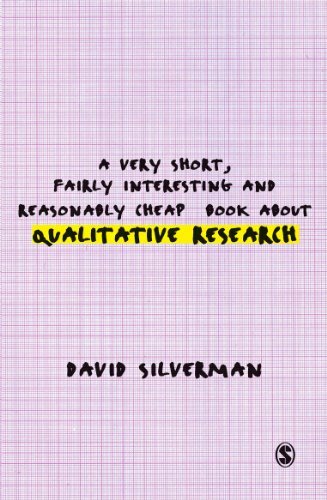 David Silverman provides an antidote to the boring textbook, which is relevant to any degree course on research methods. Brilliantly written and always challenging and entertaining, this book will challenge your perceptions and help you think `out of the box' about the nature and process of doing qualitative research.